Today Dolf and I will be guests in the radio show De Avonden. That is about the 15th (?!) radio show in which De Muzikale Verleiding is what is called an “item”. And there is stiil more to come. Somebody asked me how much money I make with all this interviews and radio shows. Huh?! I had to take about seven days off to do all this promotion in the past two weeks. |And except for two shows I even had to pay my own train tickets! Dofl and I get royalties for the book. We even got 1500 euro in advance, which is pretty much money for a project like this. I have no idea how much hours I have put in the making of this book (not to talk about Dolf and Pim), but that must be a few hundred. So if anybody thinks that you get rich by making a book (with two CDs), I have bad news. In De Avonden there will be also a guest who talks about SIRE. That is an organisation, eh, well, forget that. 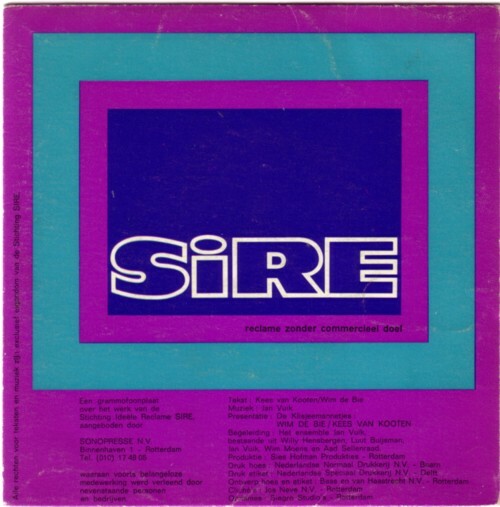 About 30 years ago Kees van Kooten & Wim de Bie made an advertisement record for SIRE.